WBA World welterweight champion Keith “One Time” Thurman says he wasn’t impressed with what he saw from Danny “Swift” Garcia (32-0, 18 KOs) in his 12 round unanimous decision win over Robert Guerrero (33-4-1, 18 KOs) last Saturday night from the Staples Center in Los Angeles, California. Garcia won by the scores of 116-112, 116-112 and 116-112. Thurman asks the question ‘when is Garcia ever impressive in his fights?’ Thurman believes that Garcia did just enough to get the win over Guerrero by relaxing and taking over the fight in the second half of the bout. In Thurman’s mind, he saw Garcia as the winner of the contest. Thurman believes that Garcia is a winner, period. He says boxing fans can hate on Garcia all they want, but he’s still a winner and now a two division world champion after capturing the WBC welterweight title last Saturday night over the 32-year-old Guerrero. Thurman didn’t address the fact that Garcia is having to struggle badly to defeat guys like Guerrero, Lamont Peterson and Mauricio Herrera, none of which would likely do well against the talented fighters at 147 like Errol Spence Jr., Thurman, Shawn Porter or Tim Bradley. “Guerrero’s pressure seemed effective within the first six rounds,” Thurman said to Fighthype. “Did he [Guerrero] win every round from one to six? I don’t really think so. But from the 6th round on, Garcia relaxed, he got into a rhythm and he started landing big punches. So landing those big punches made a big difference. Really, that’s what created the spread. Maybe Garcia won by a three round spread. He definitely won the fight. Impressed? Eh. How many times have we really been impressed with Garcia? He hasn’t been doing anything special, but he is a winner. He does what it takes to win. He did what it takes to win tonight. He’s certainly a two division world champion,” Thurman said. Floyd Mayweather Jr. saw things differently. He scored the Garcia-Guerrero fight a draw. Mayweather didn’t break down his round by round scoring, but it’s likely that he felt that Guerrero won four of the first six rounds, and then later won two of the final six rounds. Garcia was landing the harder shots, but he miserably struggled in the first six rounds, and he definitely gave away two of the rounds in the second half of the fight. The scoring for the Garcia-Guerrero fight was poor in my opinion. I think the judges blew it and should have scored it a draw instead of a win for Garcia. Garcia’s adviser Al Haymon is going to need to make a decision what he wants to do with him. He can either look for one big cash out fight where Garcia gets a big payday and loses to a quality fighter, or he can carefully and strategically maneuver Garcia around to keep him away from the dangerous fighters that would otherwise beat him and take his O away from him. Some fans believe that Haymon maneuvered Garcia around Viktor Postol by having Garcia give him a step aside so that he could fight Lamont Peterson instead, and then instead of fighting Postol, Garcia vacated his title and moved up in weight. It’ll be more difficult for Garcia to be maneuvered around the top welterweights because there are so many of them. If Garcia can’t even beat a fighter like Guerrero without controversy, then what happens with Garcia when he has to face guys like Shawn Porter, Thurman and Errol Spence? 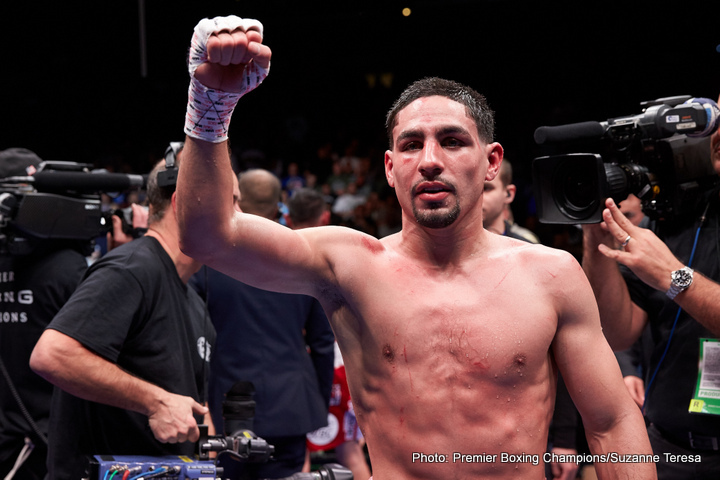 You are here: Home / Boxing News / Thurman: When is Danny Garcia ever impressive?